Wondering if your elderly loved one can benefit from the responsibility and rewards of having a pet? A perfect place to start might be with an aquarium. Harrisburg home care provider, Home Care Assistance, offers some reasons why this might be the right choice for your loved one. The sounds, motions, and colors associated with fish tanks have been shown to reduce anxiety and stress, lower blood pressure, and reduce muscle tension. 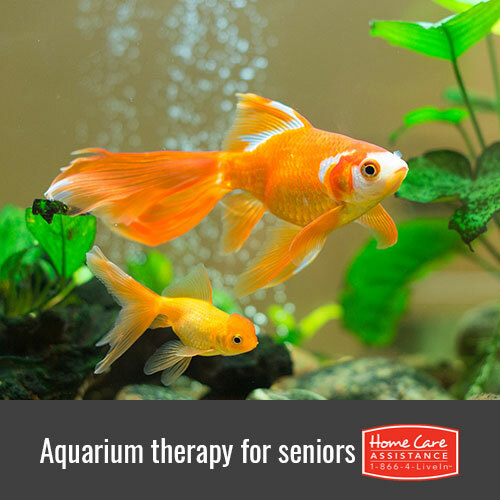 A study conducted at Purdue University also showed seniors with Alzheimer’s experienced significant health benefits from aquariums, including eating more, needing fewer supplements, and showing less aggressive behavior. Developing routines such as feeding the fish each day can help train the memory, improve concentration, and lower the risk of developing dementia. With the installation of his or her aquarium, other living creatures will depend on your loved one for their continued survival. Having a pet can give your loved one a sense of responsibility and purpose they may have been missing, which can help prevent feelings of depression and loneliness. Unlike a dog or cat, fish are relatively easy to keep as companion animals. They do not require exercise, veterinary care, expensive food, or toys. Aquariums come in all sizes, so not much space is required for their habitat. Most of the concerns regarding mammalian pets, such as fleas and ticks, do not apply to fish. While they still require food and occasional tank cleaning, fish are an easy pet for your loved one to enjoy without being overwhelmed. Owning fish can bring many moments of happiness and comfort to your loved one and positively impact his or her health, but human companionship can have an even greater impact. Provide your senior loved one with the emotional support and social stimulation he or she needs with help from Home Care Assistance. Our hourly and live-in caregivers in Harrisburg can also help with many tasks of daily living, including cooking, cleaning, and transportation, ensuring your senior loved one remains happy, safe, and comfortable in his or her own home. To learn more, give one of our friendly Care Managers a call today at (717) 540-4663 to schedule a free in-home consultation.